With the uphill month of January hitting people’s pockets hard and everyone trying to stick to their new year’s resolutions of which generally losing weight is a major focus, the home cook is being challenged to provide food that is flavoursome but light and easy on the wallet. A bowl of hot soup can usually tick all the boxes. Soup is the epitome of thrift. Think about it – you need a greater quantity – add more water; too watery and you can add a handful of rice/pasta/lentils to bulk it out. You can use cheaper cuts of meat to add flavour and any back of the fridge vegetables that are on the turn and have become slimy can make a star appearance in your soup. The possibilities are endless. All you need to remember is that at the heart of any good soup is a good stock. If however, like me, you are getting bored of the usual soup combinations, I must recommend my sister-in-law’s roasted garlic and butternut squash soup. 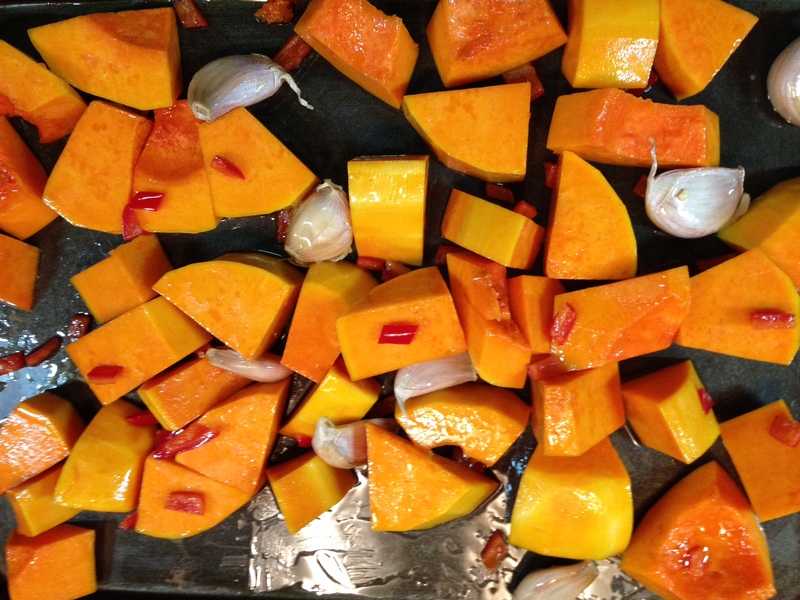 The roasted garlic turning into a sweet puree to the already sweet, orange flesh of the squash. Peel and deseed a butternut squash. Cut it into chunks of similar size and place onto a baking sheet. Break a head of garlic and add around 5 medium sized cloves in their papery wrappers. Deseed and chop a red chilli. Cover in olive oil and mix well. Place into a moderate oven for approx 40mins. Whilst waiting prepare your stock of choice (approx double your rice quantity). If making this for vegetarians make sure to use a vegetable stock but I usually use a chicken stock for extra flavour. When you take the tray out of the oven, release the garlic cloves from their skins. Put the roast veg and garlic into a blender with half of your prepared stock. Alternatively you can use a stick blender. Add more stock to slacken the soup. Once you are happy with the consistency, and different people prefer it in different ways, you are ready to serve. A bowl of this soup and some crusty bread for dunking, makes this dish a great light lunch and a convincing supper. 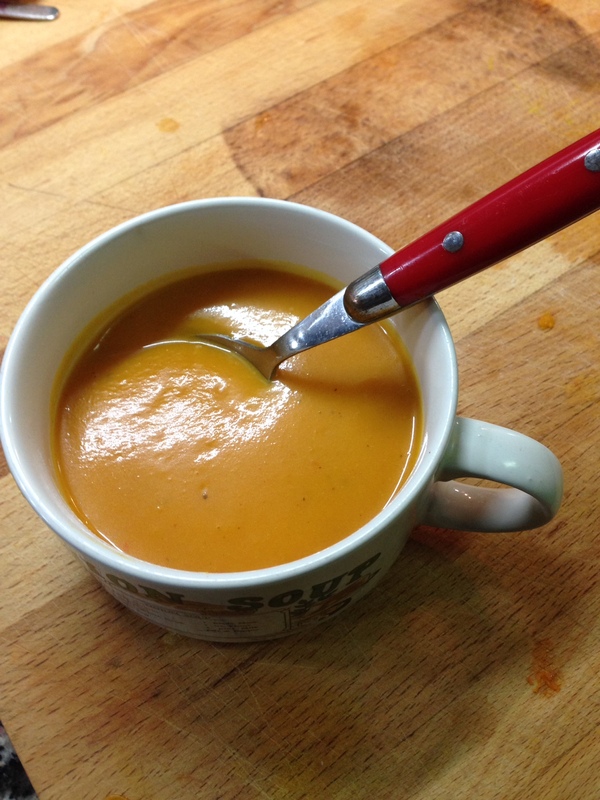 Eventually you get to eat most of the soup and there is that little bit left in a small bowl in the fridge – not enough to make a decent bowlful or you don’t fancy soup again for the third time that week! So now is your chance to convert the soup into a flavoursome stock for a delicious butternut squash risotto. 1st: First thin the soup with water and place into a saucepan to be heated through. 2nd: Heat a good knob of butter with some olive oil. 3rd: Chop an onion and add to a pan of foaming butter and soften until translucent. 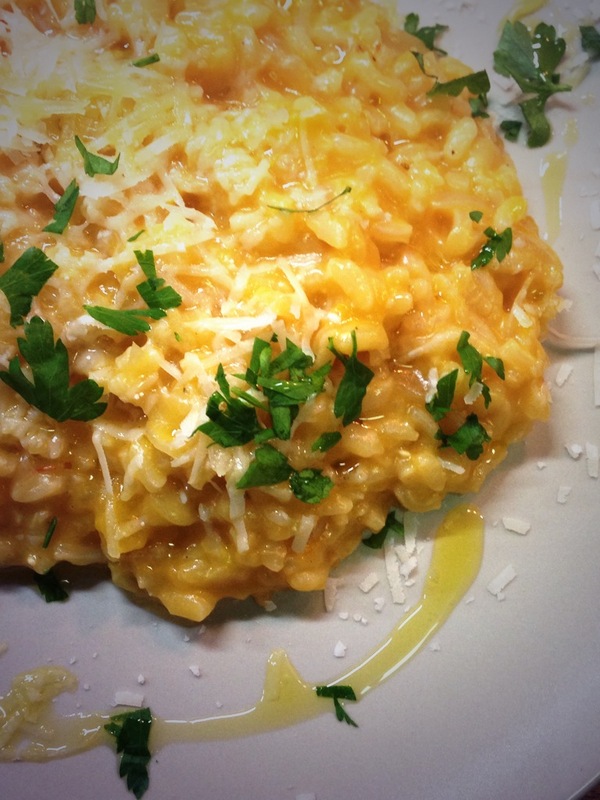 Add your risotto rice (Arborio) and cook through for 5mins. Add a splosh of sherry or vermouth to the pan and boil off the alcohol. 4th: Now, ladle the stock into the rice pan a ladle at a time, allowing the rice to absorb the stock before adding the next ladleful. Stir well and continue this process until the rice is cooked through – you may not need to use all the stock – if more is needed add warm water. Leave to stand for 3mins. 5th: Serve with a grating of parmesan cheese and a ribbon of extra virgin olive oil. Who would have thought that from one humble butternut squash (£1) and store cupboard ingredients, you can create a duo of delicious dishes, where both in the soup and the risotto the squash is the star of the show. El Capote – Chef Lede’s Christmas Cracker! Chef Lede, a very talented chef who uses techniques in molecular gastronomy made famous by chefs such as Ferran Adrià at elBulli and Heston Blumenthal at The Fat Duck, creates tantalising and imaginative dishes that play with your mind and leave you wanting more. Each dish a work of gastronomic art – 30 identical looking covers per course is no mean feat when catering for a group of people let alone when presenting a 13 course menú degustación! But for me it’s not just about the taste; it’s the theatrical performance that Lede with his assistants execute for us as they plate up; it is delicious to watch! The 13 course taster menu comprised three sections all involving seasonal produce with most of the key ingredients sourced from the Campo Area. Where I would normally go through the menu and describe each dish, there were far to many to describe in detail – however, I have been informed by Ian that Chef Lede is going to be repeating the menu with one major change: At the Christmas Special we were treated to different Sherrys to match the food. Not everyone’s favourite tipple! This meant that we couldn’t quaff throughout the meals but more especially the intermissions. So wines will be available for those of you interested in going. My favourites were: the Bollo de huevo con jamón ibérico de bellota, Carabinero con especias en su fondo marino con huevas de su americana and el Homenaje al cerdo ibérico (3 dishes): Carrilleras con panceta de cerdo, caldo texturizado de jamón, migas y chicharrones aéreos. In future – if I were to have the Homenaje al cerdo ibérico – I think it would be more effective to have the three constituent parts on the same plate to truly appreciate the deconstructive nature of molecular gastronomy. However I am aware of of kitchen constraints and why this was executed as so. If anyone is tempted by any of these dishes, or if the thought of having a test tube shot appeals to you, then I recommend you get yourself down to El Capote when they next advertise as they tend to fill up places fast!